After many years of selling our famous (to us, at least) Black and White reverse osmosis units, we’ve decided to change the way we present them. The core product will be the same tough, simple unit, but our website presentation will soon allow customers to build their own RO unit by choosing from among three basic designs then adding features. The simple three-stage unit, the core product, which has been by far the most popular style over the years, will actually go down in price, but some of the add-on options that we’ve been giving phone customers will be added for selection on the website at a modest increase in price. We’re now going to build the basic units in 3 formats only. You can see them in the pictures below. By far the most popular style is the simple three-stage unit consisting of a carbon block prefilter, the RO membrane, and a carbon block postfilter. Most standard “4-stage” RO units on the market use two full-sized filters plus a small refrigerator filter clipped to the membrane as the final carbon stage. 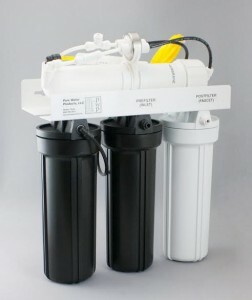 Black and White 4-stage units, by contrast, use three full-sized filters plus the membrane. In all Black and White units, prefilters are housed in black vessels and postfilters are in white housings. The unit pictured below has two prefilters (black) and a single postfilter (white). An additional carbon block filter. A scale prevention cartridges to protect the membrane from scaling. A KDF55 stage to enhance chlorine removal and inhibit growth of bacteria within the unit. An iron filter to protect the membrane from iron or manganese. An oxidizing prefilter to enhance arsenic reduction. A KDF85 stage for pretreatment of smelly well water. An extra carbon block filter. A ceramic or other extremely tight filter to assure bacteria-free water. A cation (softener resin) cartridge to remove ammonia. A deionizing (DI) cartridge to remove ammonia and reduce all dissolved solids to zero. All Black and White units built in the three basic styles above come with cartridges of your choice. The price of the unit is the same regardless of the cartridges selected. 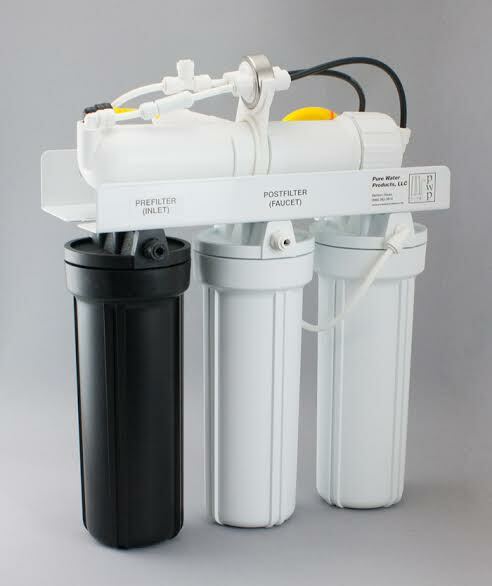 This Calcite/Coconut shell inline filter that gives a mild increase to pH and TDS is a popular postfilter add-on. Black and White units are now built only in the three basic formats shown. Any additional components are viewed as add-ons, not additional “stages” to the RO unit. Popular add-ons are inline sediment or carbon filters, ceramic filters, calcite filters, and scale reducers. Add-ons of this type usually come with their own mounting bracket for placement near the main unit. The standard faucet for Black and White units is the top quality conventional chrome Tomplinson ProFlo. It comes as standard equipment with the RO unit. There is an extra charge for upgrading to Tomlinson Designer and Contemporary faucets that are offered in a variety of finishes as options. Other Tomlinson models are available by special order. Adding a performance boosting permeate pump to the unit. Substituting a water saving Pentek encapsulated membrane for the standard Filmtec membrane. Furnishing the unit with 3/8″ tubing from the storage tank to the faucet to enhance flow to faucet and refrigerators. Including a kit to connect the RO unit to a refrigerator or other remote point of use. 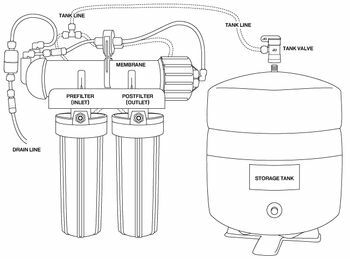 Adding an extra storage tank or a larger capacity storage tank. Adding a “demand pump” setup to deliver RO water to a remote location. Adding a “booster pump” to increase pressure coming into the RO unit. Adding a a small ultraviolet unit either before or after the RO unit. 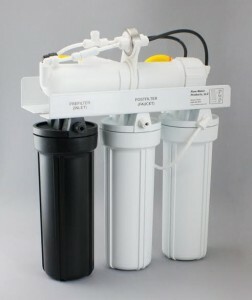 Watch for these changes on our Black and White reverse osmosis page, coming soon.